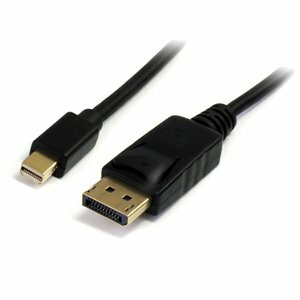 The MDP2DPMM6 Mini DisplayPort to DisplayPort adapter cable, features a Mini DP male connector on one end, and a DP male connector on the other, allowing you to connect any Mini DisplayPort-equipped laptop to an HDTV, monitor or projector that uses a standard DisplayPort connection.The mDP to DP cable supports high resolutions of up to 4k x 2k (3840 x 2160) @ 60Hz with a maximum HBR2 bandwidth of 21.6 Gbps. The cable also supports Multi-Stream (MST) for daisy chaining multiple monitors and provides optional audio support. The MDP2DPMM6 6ft Mini DisplayPort® to DisplayPort Adapter Cable, features a Mini DisplayPort (male) connector on one end, and a DisplayPort (male) connector on the other, allowing you to connect any Mini DisplayPort-equipped laptop (including the Mac® family of products) to an HDTV, monitor or projector that uses a standard DisplayPort connection. Please Note: Newer laptop and desktop computers (e.g. Apple®) come equipped with Thunderbolt ports only. Our Mini DP to DP Cables can be connected to the Thunderbolt ports, enabling you to connect your DP compatible displays.